Each lost or found pet which is added to our pet databases will be Pet Matched to all the current listing in our databases. 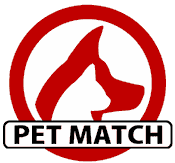 These pet matches can be found on the right hand side of any Pet Listing page. So if a pet has been listed as missing, then matching found pets will be displayed and vice versa, any found pets added to the system and matching missing pets will be displayed. Close pet matches are displayed based on location, breed, colour and a few other factors. These are pet results which we think closely match the pet listing displayed. For general pet matches we perform a less rigorous pet check of our databases. This returns a higher number of results incase the breed / colour is not properly stipulated when the pet listing was placed on our system. You are also encouraged to also perform a more wider advanced search by using our Pet Search facility which allows you to search our whole lost and found pet registers. On your Members Area homepage, you will see a list of lost and found pets which has been added to our databases based on postcode location. This gives you access to all pets which have been added locally, but to view this, you will need to be logged in. It is always worth continuing to check all missing and found pet registers, as sometimes mistakes can be made when adding lost and found pets, such as breeds (these are quite hard to get right, so check matching or similar breeds). This is a new system and the pet match results will become more accurate as more lost and found pest are added to the new system and it is based upon the inputted data when a pet listing is added.